The B1WebAPI web service is required for all Portal installations. It's the single data access point for all Portals into SAP Business One. It must be installed on the SAP Business One server, and is required before configuration can be applied to a Portal. The B1WebAPI web service acts as the sole point of contact for Portals and third-party applications looking to access B1 data. 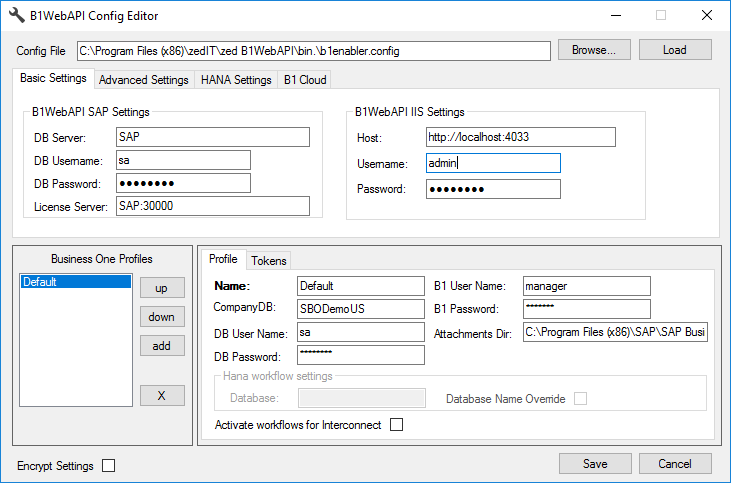 Run the B1WebAPI installer on the SAP Business One server. Step through the installer welcome screen, and prerequisites as shown below. B1WebAPI welcome screen. Press Next to continue. B1WebAPI Prerequisites screen. Press Next to continue. Select the desired components. For a typical install, all components should be enabled. B1WebAPI installs the files that will be used to run the B1WebAPI website. 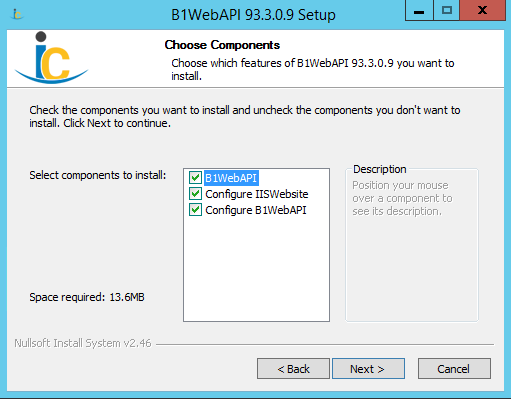 Configure IIS Website configures the B1WebAPI website in IIS. 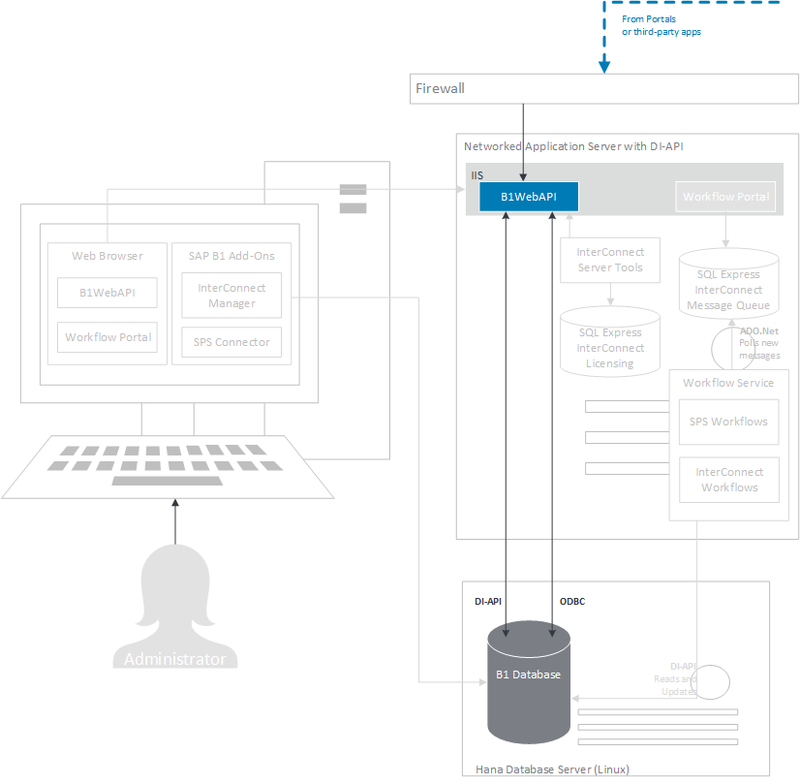 Configure B1WebAPI allows for company and database connection details to be configured. B1WebAPI Choose Components. Select the desired components and press Next to continue. Choose install location. This is the location where B1WebAPI web files will reside. Warning: Do not change the default directory for the first installation of B1WebAPI. Additional installations are rare, and may be installed in alternate locations after an initial installation has been completed. 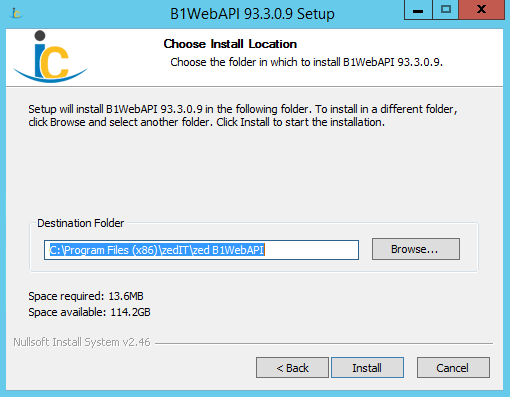 B1WebAPI Install Location can be selected. Press Install to complete the installation. 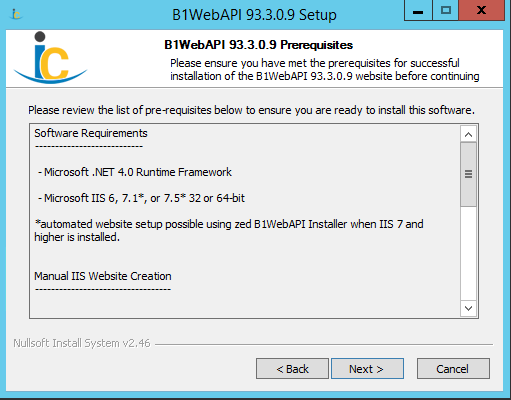 If the option to Configure B1WebAPI was selected, the following configuration screen will be displayed. This step may be skipped, in which case, InterConnect Server Tools may be used later to configure these settings. To configure B1WebAPI settings, fill in the connection details shown below. For a detailed description of each field, see Technical Reference: InterConnect Server Tools - B1Config. Ensure to configure the Attachments Directory for any Portal installation to ensure full Portal functionality. B1WebAPI connection configuration screen. Edit connection details for one or more SAP Business One companies. Press Save when complete. If the option to Configure IIS Website was selected, the following configuration screen will be displayed. Enter all details as described below. For a typical install, press okay. For additional installs, ensure “Name” and “Port” are unique, then press okay. Generate New Website will create a new website within IIS for the B1WebAPI. Default settings can be used. Use Existing Site will associate the B1WebAPI with that existing IIS website. 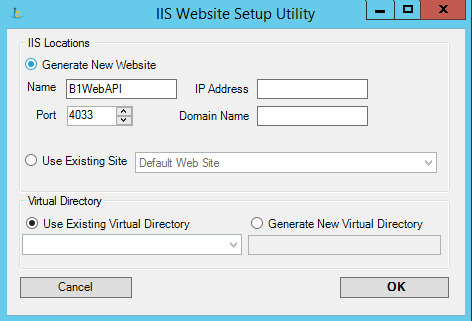 IIS website configuration screen can be used instead of manually setting up the website within IIS. Press OK when the IIS website is set up. 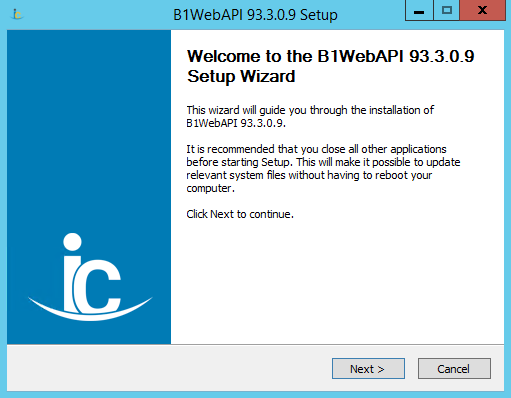 Complete the installation of B1WebAPI. 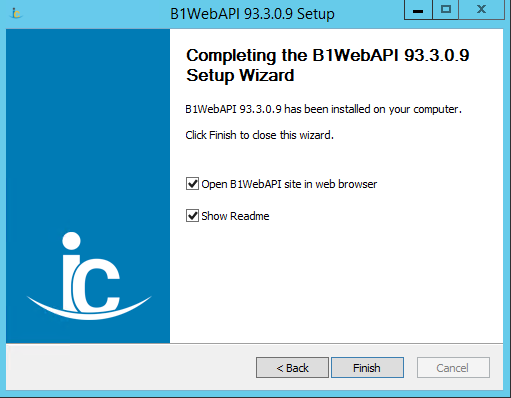 Complete the B1WebAPI installation by pressing Finish. At this point, the B1WebAPI is installed.